Find me on Google Scholar, DBLP, ORCID, LinkedIn, HAL, Research Gate. Keywords: data science, artificial intelligence, machine learning, data mining, time series classification, big data, deep learning. 2019.03 : In Hanover (MHH) for a two days meeting in the frame of the SysMifta project. 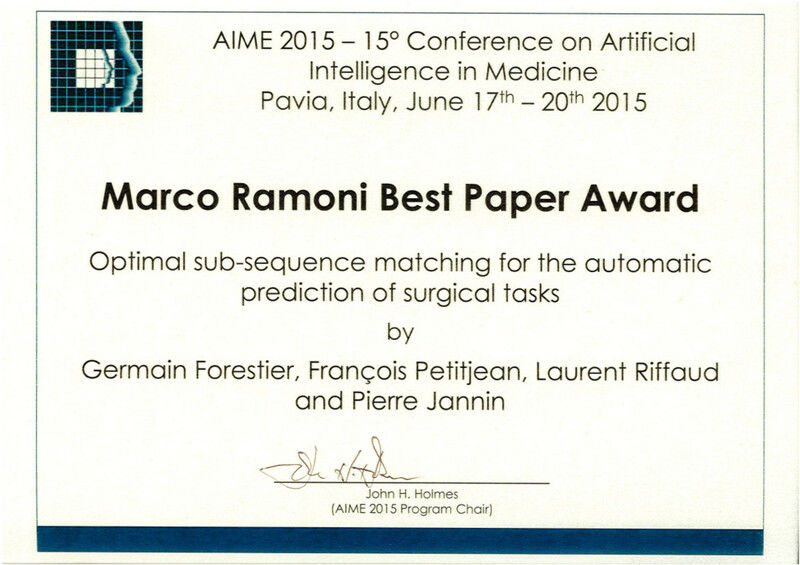 2019.03 : New conference paper accepted at AIME 2019 on automatic synchronization of multiple surgical videos. 2019.03 : Two new conference papers accepted at IJCNN 2019 on adversarial attacks for time series classification and ensemble of deep models. 2019.03 : New journal paper accepted in Data Mining and Knowledge Discovery on a review about deep learning for time series classification! 2019.01 : In Paris at LIPADE to give a seminar on Deep Learning for Time Series Classification, thanks Themis and Camille. 2019.01 : From January 1st, I hold a position of Associate Professor (Adjunct) at the Faculty of Information Technology, Monash University. 2018.12 : New conference paper accepted at IEEE ISBI on strategies for training stain invariant CNNs! 2018.12 : In Freiburg, to attend to the EUCOR Workshop in Precision Medicine. 2018.12 : In Strasbourg to attend and present our work on deep learning for time series at the ICube Deep Learning Workshop 2018. 2018.12 : New journal paper accepted in IEEE Transactions on Medical Imaging on crowdsourcing histological image labeling! 2018.11 : In Montpellier (TETIS) to be in the jury of Lynda Khiali PhD defense, thanks Maguelonne Teisseire and Dino Ienco for the invite! 2018.11 : Attending the Salon Industries du Futur in Mulhouse to present ENSISA student's project on Deep Learning for objects detection. 2018.11 : In Strasbourg to attend to the annual meeting of the MaDICS research group. 2018.11 : In Melbourne to visit once again Monash University and work with François Petitjean and Geoff Webb on time series classification. 2018.10 : Baptiste Lafabregue starts his PhD in our group on constrained clustering for satellite image time series analysis. 2018.10 : New paper accepted at IEEE BigData 2018 on transfer learning for time series classification! 2018.09 : In Strasbourg to work on the ANR TIMES with the LIVE (geography research laboratory). 2018.09 : I gave a seminar at our new research institut IRIMAS meeting on deep learning for time series classification. 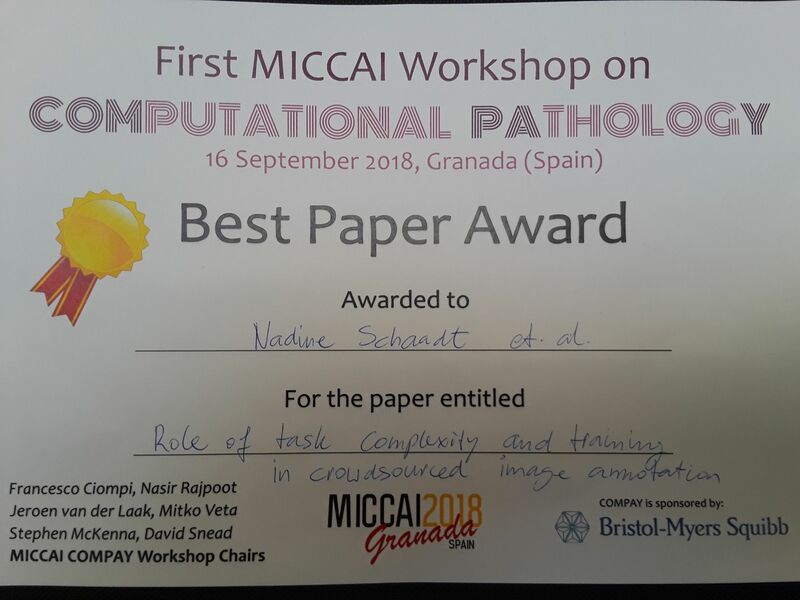 2018.09 : We won the best paper award at the MICCAI 2018 COMPAY Workshop for our paper on crowdsourcing image annotation. 2018.09 : According to Publons, I'm in the top 1% reviewers in computer science. Thanks for the award! 2018.09 : In Dublin to attend to the ECML/PKDD workshop on mining temporal data and to give an invited talk on deep learning for TSC. 2018.09 : We've just put online our lastest work: Deep learning for time series classification: a review (code is here). 2018.08 : New journal paper published in IJCARS on ontology for surgical data science (check out the OntoSPM Collaborative Action). 2018.08 : MICCAI workshop paper accepted at COMPAY 2018 on crowdsourcing for digital pathology! 2018.07 : ECML PKDD workshop paper accepted at AALDT 2018 on data augmentation with deep residual networks for time series classification! 2018.06 : In Dijon to be in the jury of Marwan Batrouni PhD defense, thanks Christophe Nicolle and Aurélie Bertaux for the invite! 2018.06 : In Berlin to present our work on surgical learning curves at IPCAI 2018 (the audience selected us a for a long presentation, thanks!). 2018.06 : Paper accepted at MICCAI 2018 on deep learning for surgical skills assessment! (code is here). 2018.06 : New journal paper accepted in Data Mining and Knowledge Discovery on constrained distance based clustering for time-series! 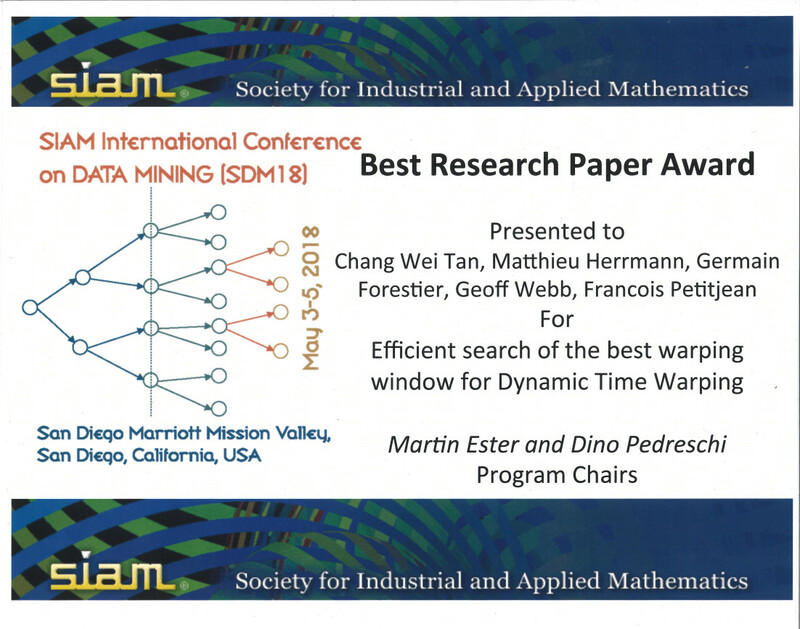 2018.05 : We received the SIAM SDM 2018 Best Paper Award for our article on learning the best warping window for DTW! (code is here). 2018.04 : In Freiburg for two days to work on deep learning for digital pathology (SysMifta project). 2018.04 : New journal paper on finding optimal warping window for DTW published in Data Mining and Knowledge Discovery! 2018.03 : I'll be area chair for ICTAI 2018 (thank you Miltos for the invite!). 2018.03 : In Paris for the ERACoSysMed – ERA-Net on Systems Medicine JTC-2015 Monitoring Meeting (SysMifta project). 2018.03 : Our paper on computing learning curves for surgical skills has been accepted for presentation at IPCAI 2018! 2018.02 : In Paris at LIPADE to work on analyzing series of remote sensing images for the ANR TIMES project. 2018.01 : In Paris for the "Atelier Fouille de Données Complexes" of the EGC conference. 2017.12 : Paper accepted at SDM 2018 on learning the best warping window for DTW! 2017.11 : I presented my work on time series analysis at the "Workshop on Mathematics, Modeling and Data Science" held in Mulhouse. 2017.11 : I defended my "Habilitation à Diriger des Recherches" (Habilitation). 2017.10 : Conference paper accepted at IEEE BigData on parameters learning for time-series classification! 2017.10 : In Milano to work on deep learning for digital pathology (SysMifta project). 2017.09 : New journal paper on contactless human–machine interface for robotic surgical training! 2017.09 : Our paper Surgical data science for next-generation interventions has been published in Nature Biomedical Engineering. 2017.08 : Conference paper accepted at ICDM 2017 on data augmentation for time-series! 2017.08 : In Munich to visit Definiens and work on digital pathology (Sysimit project). 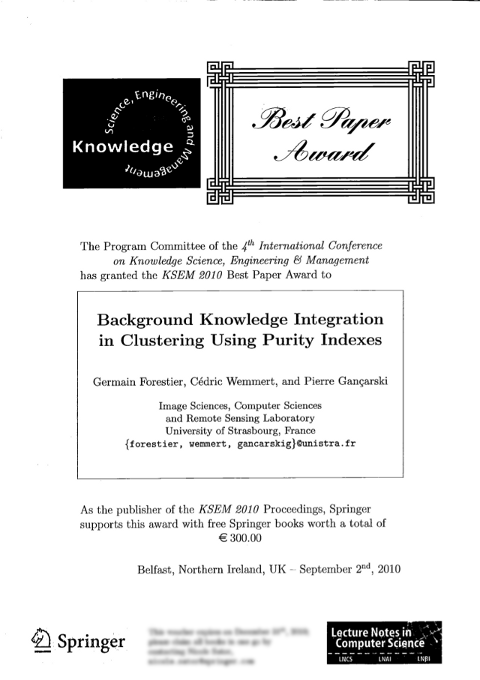 2017.07 : Conference paper accepted at ISPA 2017 on glomeruli detection! 2017.06 : In Vienna to attend to the AIME 2017 conference and to present our paper on surgical skills assessment. 2017.05 : Journal paper accepted in Breast Cancer Research and Treatment on image analysis of immune patterns! 2017.03 : Conference paper accepted at AIME 2017 on surgical skills assessment! 2017.03 : Journal paper accepted in Artificial Intelligence in Medicine on surgical activity prediction! 2017.01 : I've been appointed Adjunct Senior Lecturer at Monash University (working with François Petitjean and Geoff Webb). 2017.01 : Our paper on Surgical Data Science is available on arXiv. 2016.12 : I'm visiting Monash University as invited researcher for 6 weeks to work with François Petitjean and Geoff Webb. I'm reviewing for multiple journals (see my Publons profile). Tsegamlak Terefe, PhD student [2019 - ...], Time series classification. Baptiste Lafabregue, PhD student [2018 - ...], Constrained clustering of satellite image time series. Mounir Bendali-Braham, PhD student [2017 - ...], Analysis of crowd trajectories from videos. Hassan Ismail Fawaz, PhD student [2017 - ...], Deep learning for time series classification. Abdoul Djawadou Salaou, PhD Student [2016 - ...], Semi-supervised metric learning for temporal data analysis. Bastien Latard, PhD student [2016 - ...], Semantic analysis for research articles retrieval. IEEE Transactions on Medical Imaging. , pp. In Press. Artificial Intelligence in Medicine. Vol. 81, pp. 3-11.
International Journal of Computer Assisted Radiology and Surgery. Vol. 13(9), pp. 1397-1408. Data Mining and Knowledge Discovery. Vol. 32(6), pp. 1663-1707. Data Mining and Knowledge Discovery. Vol. 32(4), pp. 1074-1120.
International Journal of Computer Assisted Radiology and Surgery. Vol. 13(5), pp. 629–636. International Journal of Computer Assisted Radiology and Surgery. Vol. 13(1), pp. 13-24.
International Journal of Computer Assisted Radiology and Surgery. Vol. 13(9), pp. 1419-1428. Nature Biomedical Engineering. Vol. 1(9), pp. 691. Artificial Intelligence in Medicine. Vol. 82, pp. 11-19. Breast Cancer Research and Treatment. Vol. 164(2), pp. 305–-315. Journal of Biomedical Informatics. Vol. 67, pp. 34-41. Scientific Reports. Vol. 6, pp. 33322. Computers in Biology and Medicine. Vol. 74, pp. 91-102. Knowledge and Information Systems. Vol. 47(1), pp. 1-26. Information Sciences. Vol. 361, pp. 48-65. IEEE Transactions on Biomedical Engineering. Vol. 63(6), pp. 1280-1291.
International Journal of Computer Assisted Radiology and Surgery. Vol. 10(6), pp. 833-841. Knowledge-Based Systems. Vol. 73, pp. 212-226. Artificial Intelligence in Medicine. Vol. 62(3), pp. 143-152. Journal of Web Semantics. Vol. 294, pp. 19-30. Journal of Biomedical Informatics . Vol. 52, pp. 279-292. Journal of Biomedical Informatics . Vol. 46(5), pp. 822-829. Computers & Geosciences. Vol. 54, pp. 88-96.
International Journal of Remote Sensing. Vol. 34(7), pp. 2327-2349. IEEE Transactions on Medical Imaging. Vol. 32(1), pp. 110-118. Computers, Environment and Urban Systems. Vol. 36(5), pp. 470-480. Journal of Biomedical Informatics. Vol. 45(2), pp. 255-264.
International Journal of Neural Systems. Vol. 21(6), pp. 475-489. Pattern Recognition Letters. Vol. 31(15), pp. 2364-2374. Elsevier. Data & Knowledge Engineering. Vol. 69(2), pp. 211-228. Elsevier. IEEE Geoscience and Remote Sensing Letters. Vol. 6(3), pp. 533-537. EURASIP Journal on Advances in Signal Processing - Special issue on Machine Learning in Image Processing. Vol. 2008(1), pp. 374095. Hindawi. In Medical Image Computing and Computer Assisted Intervention - MICCAI. Grenada, Spain Vol. 11073, pp. 214-221. In SIAM International Conference on Data Mining. San Diego, California , pp. 225-233. In IEEE International Conference on Data Mining. New Orleans, Louisiana , pp. 865-870. In International Symposium on Image and Signal Processing and Analysis. Ljubljana, Slovenia , pp. 19-24. In International Conference on Theory and Practice of Digital Libraries. Athens, Greece Vol. 10450, pp. 608-611. Springer. In IEEE International Conference on Tools with Artificial Intelligence. Boston, Massachusetts , pp. 260-264. In AIME 16th Conference on Artificial Intelligence in Medicine. Vienna, Austria Vol. 10259, pp. 136-145. Springer. In IEEE International Conference on Big Data (Big Data). Boston, Massachusetts , pp. 917-922. In International Conference on Digital Information Management (ICDIM). Porto, Portugal , pp. 107-113. In International Conference on Knowledge Science, Engineering and Management. Passau, Germany Vol. 9983, pp. 555-566. In Machine Learning and Data Mining in Pattern Recognition. New York, USA Vol. 9729, pp. 58-72. Springer. In International Symposium on Image and Signal Processing and Analysis. Zagreb, Croatia , pp. 154-159. In AIME 15th Conference on Artificial Intelligence in Medicine. Pavia, Italy Vol. 9105, pp. 123-132. Springer. In IEEE International Conference on Data Mining. Shenzhen, China , pp. 470-479. In Model and Data Engineering. Larnaca, Cyprus , pp. 154-168. 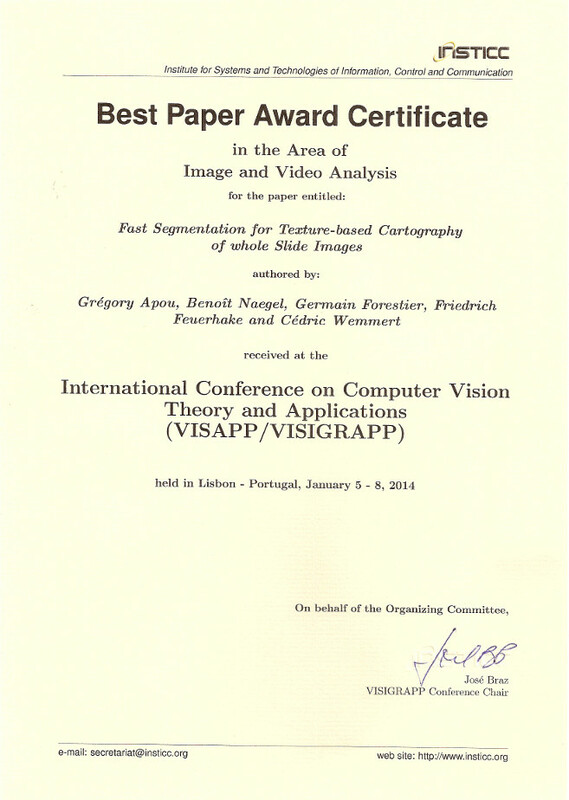 In International Conference on Computer Vision Theory and Applications. Lisbon, Portugal , pp. 309-319. In IEEE Geoscience and Remote Sensing Symposium. Melbourne, Australia , pp. 2986-2989. In ACM/IEEE International Conference on Model Driven Engineering Languages and Systems. Miami, Florida , pp. 138-153. In International Conference on Knowledge Science, Engineering and Management. Dalian, China Vol. 8041, pp. 64-75. In IEEE International Conference on Image Processing. Melbourne, Australia Vol. 13, pp. 1125-1129. 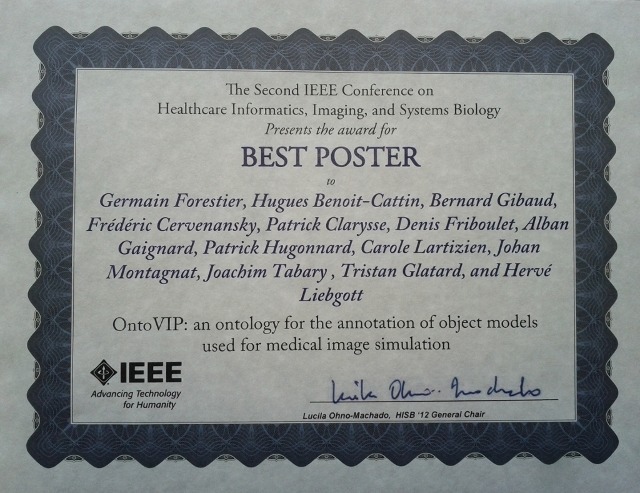 In IEEE International Symposium on Biomedical Imaging. Barcelona, Spain , pp. 98-101. In International Symposium on Computer-Based Medical Systems. Bristol, UK , pp. 1-6. In International Conference on Knowledge Science, Engineering and Management. Belfast, UK Vol. 6291, pp. 28-38. Springer. In IEEE International Conference on Intelligent Systems. London, UK , pp. 361-366. In International Conference on Intelligent Data Engineering and Automated Learning. Paisley, UK Vol. 6283, pp. 45-52. Springer. In SPIE Europe Remote Sensing. Berlin, Germany Vol. 7478, pp. 9p. In IEEE Geoscience and Remote Sensing Symposium. Boston, Massachusetts Vol. 4, pp. 395-398. In IEEE International Conference on Tools with Artificial Intelligence. Patras, Greece Vol. 1, pp. 472-479. In Workshop on Computational Pathology, MICCAI. Vol. 11039, pp. 44-51. In ECML/PKDD Workshop on Advanced Analytics and Learning on Temporal Data. In International Workshop on Pattern Mining and Application of Big Data, PAKDD. Ho Chi Minh City, Vietnam Vol. 9441, pp. 29-40. Springer. In Workshop on Mining Multiple Information Sources, IEEE International Conference on Data Mining. Miami, Florida , pp. 501-506. In European Workshop on Evolutionary Computation in Image Analysis and Signal Processing. Napoli, Italy Vol. 4974, pp. 295-304. Springer. In Workshop on Mining Complex Data, IEEE International Conference on Data Mining. Pisa, Italy , pp. 211-217. In Communications in Computer and Information Science. Vol. 550, pp. 239-256. Springer. In Studies in Computational Intelligence. Vol. 245, pp. 135-148. Springer. In Studies in Computational Intelligence. Vol. 126, pp. 71-88. Springer. Technique et Science Informatiques. Vol. 35(1), pp. 31-53. Revue des Nouvelles Technologies de l'Information. Vol. 35/1(RNTI-E-27), pp. 23-42. Numéro spécial "Fouille de données complexes". Revue des Nouvelles Technologies de l'Information. (RNTI E.21), pp. 147-169. Numéro spécial "Fouille de données complexes : données multiples". In Journées Francophones Extraction et Gestion des Connaissances (EGC 2015). Luxembourg, Luxembourg , pp. 263-274. In Journées Francophones Extraction et Gestion des Connaissances (EGC 2014). Rennes, France , pp. 565-568. In Journées Francophones d'Ingénierie des Connaissances (IC 2013). In Journées Francophones Extraction et Gestion des Connaissances (EGC 2012). Bordeaux, France , pp. 489-494. In Rencontres de la Société Francophone de Classification. Orléans, France , pp. 157-160. In Journées Francophones Extraction et Gestion des Connaissances (EGC 2010). Hammamet, Tunisie , pp. 127-132. In Atelier Fouille de données complexes, Journées Francophones Extraction et Gestion des Connaissances (EGC 2010). Hammamet, Tunisie , pp. A143-A152. In Atelier Extraction de Connaissance à partir d'Images, Journées Francophones Extraction et Gestion des Connaissances (EGC 2008). Sophia Antipolis, France , pp. 71-81. In Journées Francophones Extraction et Gestion des Connaissances (EGC 2008). Sophia Antipolis, France Vol. 2, pp. 469-474. In ECML/PKDD Workshop on Advanced Analytics and Learning on Temporal Data, Invited Talk. Dublin, Ireland, September, 2018. In Monash University. Melbourne, Australia, November, 2016. In Stanford University, School of Medicine, Invited seminar speaker. Stanford, CA, July, 2015. In Virtual Imaging Platform - Launching Workshop. Lyon, France, December, 2012. In Industry Workshop: Foundations for Biomedical Data and Model Interoperability. Cambridge, UK, March, 2011. In Journée GDR CNRS-Inserm STIC-Santé, Partage de modèles d'objets anatomiques et physiologiques pour la simulation d'images médicales cliniques. Paris, France, January, 2011. In Journée GT-EGC Fouille de Donnés Complexes sur le thème Complexité lié aux donnés multiples. Paris, France, June, 2010. In Journées GDR I3/SIGMA-CASSINI Informations Géographiques et Observation de la Terre. Montpellier, France, November, 2010. In Journées GDR I3/SIGMA-CASSINI Informations Géographiques et Observation de la Terre. Toulouse, France, November, 2009. In Journée GT-EGC Fouille de Donnés Complexes sur le thème Complexité lié aux donnés multiples. Paris, France, June, 2009. In University of Houston (UH) Department of Computer Science, Invited seminar speaker. Houston, Texas, December, 2009. In Journées GDR I3/SIGMA-CASSINI Informations Géographiques et Observation de la Terre. Strasbourg, France, November, 2007.